When newly-launched mobile services startup Tagga.com was looking for a way to explain its text messaging services to customers and investors, it turned to fellow Vancouver-based Invoke Media for advice. Tagga.com described their concept and used big, scary words like ‘mobile bookmarking’, ‘optimised microsites’ and ‘white label sms campaigns’. The folks from Invoke Media understood them — but the creatives also knew that some consumers would not, and so made them a Claytorial. A Claytorial is an animated video that uses colourful clay shapes to tell a story. 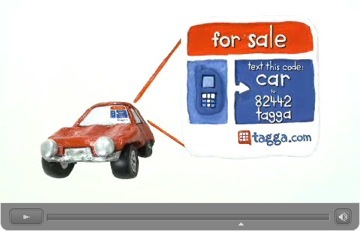 It’s a simple, visual way to explain complicated ideas and in Tagga.com‘s case, it turned out to be a perfect communications vehicle. Check out Tagga.com’s Claytorial. “Invoke‘s Claytorial generated a tremendous amount of organic traffic and PR for Tagga.com. Invoke‘s creative team really helped us to distill our message and create a fun and clear method to communicate our business to a broad audience. We use the Claytorial to explain what Tagga.com is all about to new site visitors, potential partners, customers and financiers,” says Tagga.com‘s CEO, Amielle Lake. Claytorial is not a free service, however: the duration of the video and the quantity of animations effect the end price of the project. But if you’re looking for a simple yet fun way to communicate your product, idea or service, you could do worse than to turn them into clay.